Author: MacGregor, Roy Set In . . . Description: Travis and the Screech Owls are flying to Nagano, site of the 1998 Winter Olympics, to play in Big Hat - the same arena where for the first time NHL stars competed for medals and women played Olympic hockey! No one is more excited than Nish to be in Japan, the land of the rising sun – and the electrically heated toilet seat, and a soft drink called “Sweat”! He and the gang see new things on-ice too. Their Japanese opponents play a very different style of hockey. And Nish, who has discovered a new form of martial arts on his trip, is counting on a mysterious “force shield” to help his game. Then a shadow falls over the tournament. The mayor of Nagano collapses at the opening-night banquet. The Owls are caught in a freak avalanche while snowboarding. A menacing stranger is following them.…As the Owls head to the finals, one question is on everyone’s mind: When will the nightmare end? 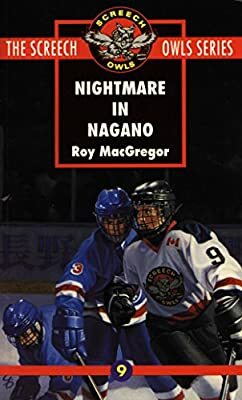 Nightmare in Nagano is the ninth book in the Screech Owls Series.